What kind of toad does one have to lick to see the empty bed of a beat-up Chevy S10 and envision a home for a 500-HP Eldorado drivetrain? Nice Price or Crack Pipe doesn't know, but damn, baby got back. Suffering a a fate worse than the 1906 earthquake, yesterday's custom '75 caprice convertible fell to a 78% Crack Pipe vote. Its pristine restoration was overcome by its questionable presentation, something today's candidate doesn't suffer from. Leave Your Heart in San Francisco for $14,000! The Chevy S10 pickup truck- workhorse of gardeners nationwide- would not be the first choice of many for hot-rodding. While the engine bay is roomy enough for a pony-packing motor, the light rear end means putting the power down requires sandbags or a sextet of drunken frat boys in the bed to keep it from hopping around like a horny rabbit. But all that changes when you shift the center of mass to be more rear-weighted. That's the thinking (and apparently a lot of beers) that went into this 1987 S10 with a Cadillac 500-cid engine in the back. Looking at the pictures, you can see that not much thought has been given to practicality, but that's okay, this is more of a "watch this" than "help me with this" kind of truck. The seller doesn't say, but we assume the original S10 motor and transmission have been yanked, which will change the driving dynamics from pickup truck oversteer to why won't it turn, doesn't it see that tree! understeer. But you get the impression that this truck was intended only to be turning at the end of a quarter mile run. The ad claims 500-bhp, and makes the recommendation of wheelie bars. Whether that's pure hyperbole or not, it's fun to imagine lighting it up and popping that nose in the air. 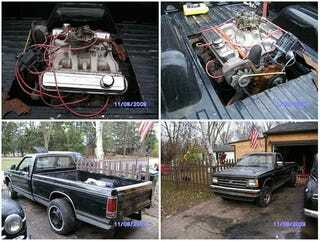 Would you also be crasy crasy to plunk down $2,500 for the opportunity to bed this pickup? Or, does that price make you pop a wheelie in your pants? Madison "crasy crasy" Craigslist or go here if the ad disappears. Hat tip to tempesjo!